The NBA draft lottery is finally here and tanking teams are prepared to receive their fate. Who will land Luka Doncic or Deandre Ayton? We'll soon see. One of the oddest days of the NBA calendar is here, with the draft lottery set for Tuesday night. Of course, as is tradition, teams that have tanked all year will wait for ping pong balls to decide their future. Celebrities like Jerry West, De'Aaron Fox and others will be on hand to receive the news. Andrew Sharp: Lottery night is fun for exactly eight minutes so it's hard to put it on the same level as NBA free agency, NBA trade deadline, Game 1 of the NBA Finals, Christmas is definitely up there as well, even though it's not a real holiday, according to Kyrie Irving. But I love the lottery and I'm really, really psyched for Tuesday night. What are your thoughts? Ben Golliver: This was another thing where the logistics of being a writer got in the way of what might be one of the NBA's better nights, because logistically the lottery occurs when I'm at a Western Conference finals game every single year. It's like right before the game starts and you're trying to scramble to put together a quick news and analysis piece right before you go out and watch a game. So it's not ideal from a workflow standpoint. It's more stress than fun when you're in the middle of it, but there's so many of them that you can remember where you were when the Pelicans got Anthony Davis and everyone is throwing out the conspiracy theories: 'Oh, Stern rigged it.' Cleveland winning like 14 times in a row, every one of those was memorable. There's been a lot of them so I'm with you, it is one of the better moments. It's just not a top 5 thing for me because it's stress not relaxation and letting your mind wander. You then have to go out and immediately try to figure out what Golden State's going against in James Harden. Sharp: I was heartbroken when the Pelicans got Anthony Davis. The Wizards were in the mix that year, and there was such a steep dropoff after Anthony Davis. Bradley Beal has turned out to be great but there was also Andre Drummond, Michael Kidd-Gilchrist. That was the year Waiters went No. 4. It was a weird draft after Anthony Davis, who was clearly a future Hall of Famer, even at 19 years old. So that was rough. Golliver: That's when careers are made and broken, right? You get Anthony Davis and your franchise is on the up and up however many years later. You look at Rich Cho and the Hornets. They get No. 2, they go Kidd-Gilchrist and now he's out of a job and he's back to food blogging. Mitch Kupchak is in there and trying to hire a first-time head coach and retooling things all over again. Those ping pong balls are no joke. Sharp: Yeah, it's rough. In general, though, what I appreciate about the lottery is that it's completely ridiculous to have a night and have this system that truly does shape the landscape of the league and use ping pong balls and everyone sends their celebrity representative. 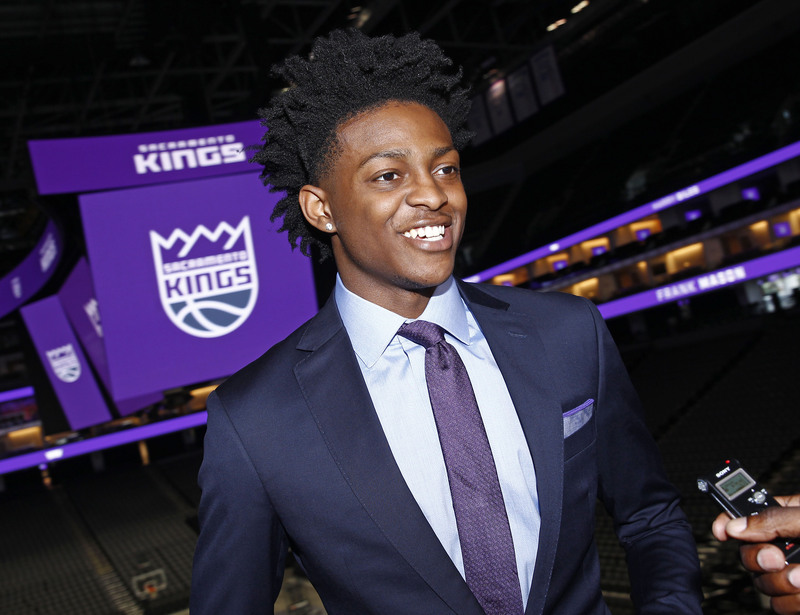 I know De'Aaron Fox of the Kings will be there and sometimes there's owners kids, and the whole thing is just awesome and pretty unique to basketball. So... let's play the lottery simulator a couple different times here and see what's in play. 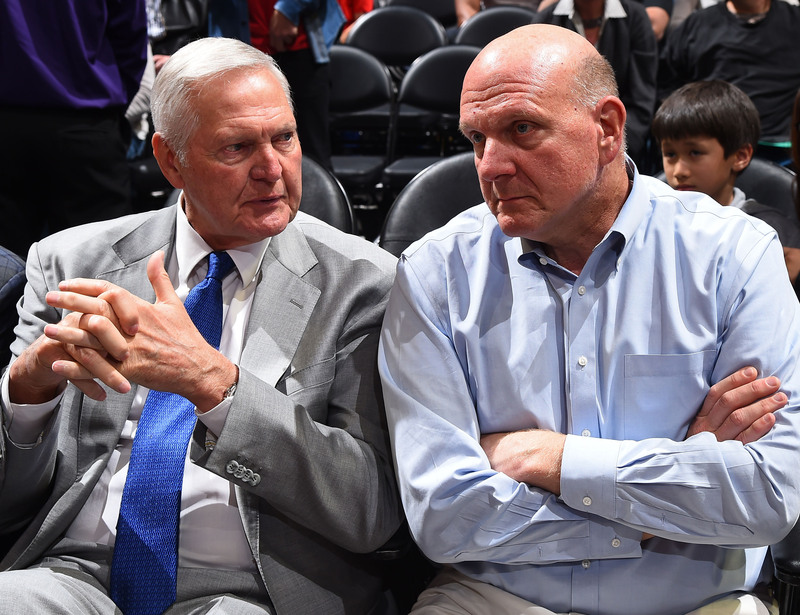 Golliver: Can we at least say that Jerry West is going to be the guy representing? You said celebrity representative and came up with De'Aaron Fox. I think people might have heard of him from the logo of the league. He's going to be there for the Clippers. It's pretty funny. We'll play the simulator. Sharp: To be honest with you, I thought Jerry West was above that at this point in his career. I'm happy for him that he's getting out. He seems to be doing really well in L.A., but if I was Jerry West I'd be like you really want me to go be the team ornament at the lottery? Golliver: Well, I think he's thinking bigger. He wants some facetime before free agency, reminding everybody that he's still a player, sending some telepathy toward LeBron who's at home smarting after a Game 1 loss. That could be part of the scheme. The other thing I'd say too real quick is that I've never attended the lottery and the people who have rank it very high on their list, right? Sharp: I loved it last year. It's kind of the best cocktail party ever for the hour beforehand and then you show up and get into the actual staging room and it's hilarious. I've never been to the top-secret room where they confiscate all of your electronics and make you just sit there for 45 minutes like you're a hostage. But that's on the bucket list. Golliver: Alright, let's play this lottery game. I played it on my end and I've got some interesting results, but you go first. Sharp: OK, so on my end, I have the Bulls at No. 1 taking Deandre Ayton, the Dallas Mavericks taking Luka Doncic, which would be pretty phenomenal. I would love a Doncic-Dennis Smith backcourt. And then Jerry West's L.A. Clippers taking Marvin Bagley III. And by the way, it's a good point with Jerry West headed to the lottery. That's just a good way to signal to the rest of the league that Doc Rivers isn't running that organization anymore. I think that's a good strategic play from him and Steve Balmer. But then Nos. 4, 5 and 6; I really do feel like the Suns are destined to fall in this lottery. I feel like there's some bad karma there after five years of half-assed tanking and just disregarding any sort of plan or any of your fans. I don't think things are going to break very well for the Suns. And then Memphis at five and the Hawks at six. One other thing to keep in mind as we go forward: The Cavs and the Nets pick, that is a huge story for the whole league. In my little simulation, they fell to nine. If they do move up to that top 3 spot. That makes it a lot more likely that LeBron is coming back to Cleveland. Golliver: Stop right there, Andrew. Stop the presses. I ran the lottery mock draft. No. 1 is the Memphis Grizzlies and they take Luka Doncic, the Cleveland Cavaliers jump up to the No. 2 spot and they take Deandre Ayton, No. 3: Chicago Bulls, Jaren Jackson Jr. and No. 4, our favorite team, the Phoenix Suns get Marvin Bagley III. So we both have Phoenix dropping in these. I think we need to go back to something we mentioned earlier. Don't you think there's basically willing to auction off everything on their roster to get Luka? If they drop to four, isn't it just going to be like the Markelle Fultz situation last year? Or some other situations in the league we've seen before, where a team just becomes enamored with a guy because of personal connections or whatever else and they pull out all the stops? Sharp: Yeah, and it's hard to know what's in play with Phoenix because it requires assuming that someone is in charge and that someone cares and that there is a standard to adhere to, and there may not be. There's not really any evidence that anyone out there is working with a coherent plan, but I think if you are Phoenix--jokes and potshots aside--this is it. This has got to be the draft where you kind of go all in to get one more piece. Extending the mediocrity out any further starts to jeopardize the future with Devin Booker, if you haven't started down that path already. And I think you go all in, get Doncic or Ayton in this draft and then try to go sign someone this summer and move on from there. That's the only play if you're Phoenix. Sharp: What's the market like for Schroder at this point? I don't know that anybody out there is ready to roll the dice on old Dennis. Golliver: Here's my point on the disgruntled point guards in the East--actually everywhere now: There's so many guys who are in situations where they should be traded that there's going to be a point guard for point guard trade this summer, definitely. Between Teague, Lowry, Reggie Jackson, German Reggie Jackson, also known as Dennis Schroder. There's so many of these guys hanging around, just wearing out there welcome that there's going to be some musical chairs. Sharp: One of my favorite things that you've ever said is Dennis Schroder is German for Brandon Knight. It's one of the meaner things you've ever said about a player, but also pretty accurate. Sharp: Stop, we've taken enough shots at the Suns. I will say this: Marvin Bagley III would be a perfect Sun and/or a perfect Sacramento King. I'm getting some Shareef Abdul-Rahim vibes from him, where he's going to go somewhere and average 24 and 12 for the next 10-15 years and no one will notice. Every year he will be on 30-35 win teams and part of that is my Duke bias seeping through here, but I'm just not that impressed by that dude. Golliver: One more shot at the Phoenix Suns: If people didn't read Anthony Slater's Western Conference preview piece about Mike D'Antoni and Steve Kerr, it's a long read on The Athletic but it's well worth your time. Very deep in that piece is an anecdote about Robert Saver, who asked Mike D'Antoni about 10 years ago, 'Hey, Mike, if you're only going to play eight guys in your rotation, why do we have to pay up 13 players? Can't we just pay nine?' That's a winning mentality. Only championship mentality need apply down there in Phoenix. Sharp: Yeah, we talk a lot about winning players. That's Robert Saver. Well, this is a good place to end. I just did the lottery simulator again and the Celtics jumped up to No. 3, which is in keeping with the last month of bull---- Celtics fortune that we've had to endure. But look, if Boston gets a top 3 pick I personally am going to pencil Kawhi Leonard into next year's team.